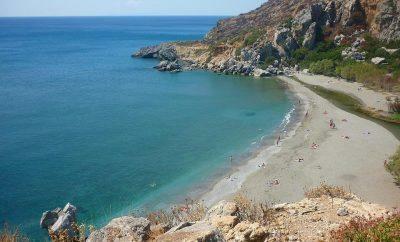 Frangokastello is a village situated in Sfakia, Crete, about 16 klm from Chora. 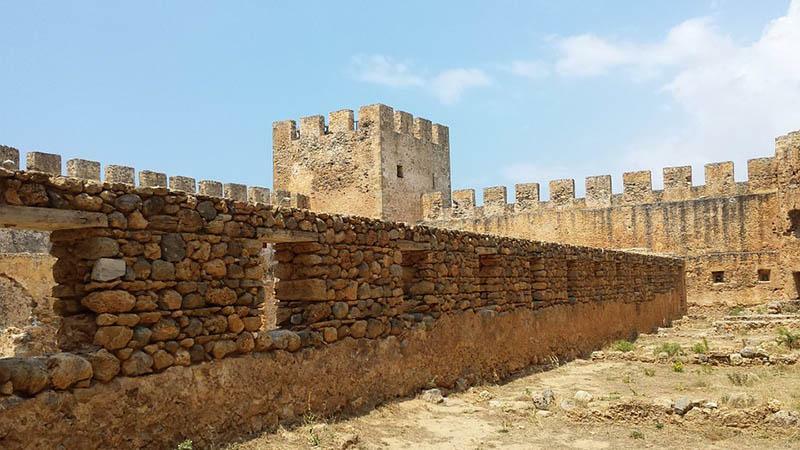 It features one of the most important sights you can visit in the area of Chania: The Medieval Venetian Castle! Dating from the 14th century BC, built by the Venetians who occupied the land at the time, this castle still dominates the vista of the entire area, despite having only the outer walls and towers intact. During the Greek Revolution, in the year 1828 a terrible, vicious battle took place between the Cretans and the Ottomans. The Ottomans won, massacring a good part of the Cretan fighters- and that, legend says, is what is responsible for the ghostly, mysterious phenomenon that you can see with your very own eyes: Every year in the end of May and up to the beginning of June, just before daybreak, you will be able to stand in a specific place in Frangokastello (you will be shown where) and see the shadows of the dead warriors marching towards the sea, armor sparkling. It lasts for about 8 minutes. Is it actually the ghosts of those warriors? Is it something else? It depends on who you ask- but everyone knows them by their name: Drosoulites. But even if you’re not into ghost stories, history or mysteries, Frangokastello is a great place for relaxing and family vacations! There’s a diverse array of things to see and places to be besides the Venetian castle. 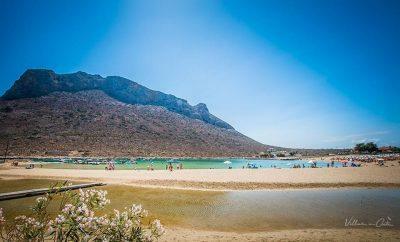 The beaches are shallow quite far into the sea, making them warm and ideal for families. They are also mostly undeveloped, staying true to origins rather that having the environment and surroundings spoiled by over-exploitation or tourism. In fact, relatively few tourists venture in this area so you will have the chance to truly enjoy the local colour and the famed hospitality of the locals! Still, the beach of Frangokastello does have some umbrellas and sunbeds for your convenience. Several other beaches are quiet and picturesque, perfect for strolls along the seaside- such as Fata Morgana, Orthi Ammos and Koutelos beach. If you are less of a beach person and more of an adventuring, hiking type person, Frangokastello has you covered! All you need to do is head over to the breathtaking gorge of Imbros and the valley of Kares to enjoy the amazing views and do some trekking! You will encounter lush green, several different kinds of trees in the forest, beautiful flowers and even some mountain goats! It is also a gorge that is easy to trek, so it’s ideal for beginners. In the village of Frangokastello, you will have a choice of tavernas where you will find traditional home made style food and a healthy range of choices including options for vegetarian and vegan guests. Many of them boast great views of the sea and valleys. Disclaimer: The article (text) is subject to copyright unless specifically stated otherwise. You may not copy, store, share or redistribute any content by any means mechanical or electronic without the express written consent of the copyright owner.